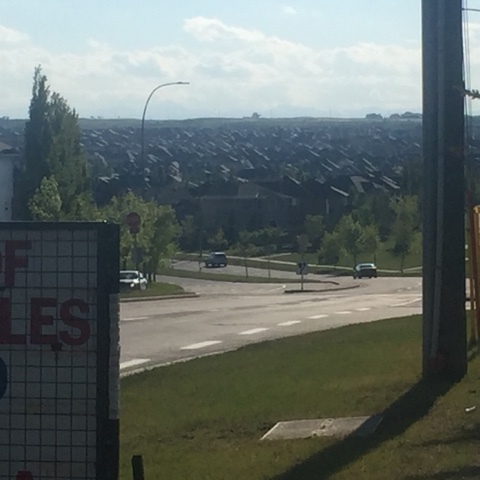 On Monday, I decided to go for a quick run to get my legs moving after my sister went back to Saskatoon. It was raining steadily but not heavy which was great but the wind sucked big time - depending on the direction you were going. The first half of my run was against the wind so I was cold and miserable and then on my way back, I was hot and sweaty. I got rained on no matter which way I was running. It was just a quick run before my 10km on Tuesday. After I got home from my run, I tracked down this old core workout that I had on my iPhone. I did it 3x through. On Tuesday, Penelope stayed home from school which means I couldn't do my typical Tuesday morning run and would be forced to do 2 things I don't particularly enjoy: running at night and around my neighbourhood. The girls had soccer so Greg needed my vehicle which was why I couldn't go to Fish Creek to run. Running in the evening sucked because it was quite warm outside but instead of running around Bridlewood, I ran to 162nd from my house and then to JM drive and ran all the way down there until I hit the 5km mark and turned around and ran home. I did pretty good and had an average pace of 6:40/km. And the best part (perhaps not health wise) was that Greg brought me home a slush to help cool me off. On Wednesday I headed to bootcamp like I do every Wednesday. We did some running, squats, burpees, pushups, step ups, and some core and probably some stuff I don't remember anymore. It was a good workout because I felt it the next day for sure. I forgot to take a photo for the review this week so I took it once I remembered when I was home. On Thursday morning, I woke up feeling like death thanks to the head cold that Penelope so graciously shared with me. 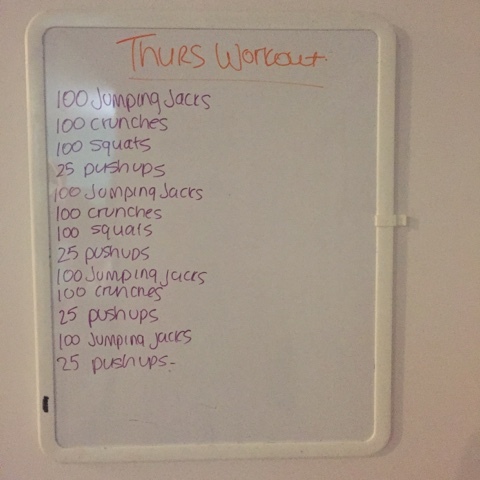 I decided against running since my throat hurt so badly and I was so congested but I still wanted to get a workout in so I did the above one although I only did 50 instead of 100 of all the exercises. Still a solid workout that I definitely could feel. Thursday also saw a lot of stretching, rolling and strength training. 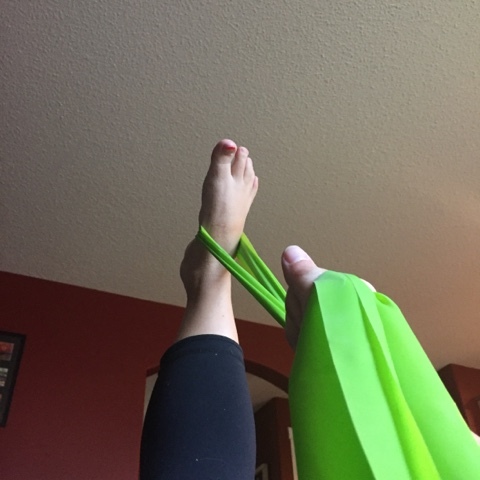 While I have been very consistent with my foam rolling of my quads and it band, I haven't done much of the other stuff so spent a full 30 minutes doing so and I hope it is helping me get my strength back in my right hip. Friday saw no running or working out at all. My best friend was visiting from Shellbrook with her little guy and her mom and so we spent the day shopping, getting soaked at the zoo, dinner at Blue Star Diner and we finished the day off at the swimming pool and waterslides at their hotel. 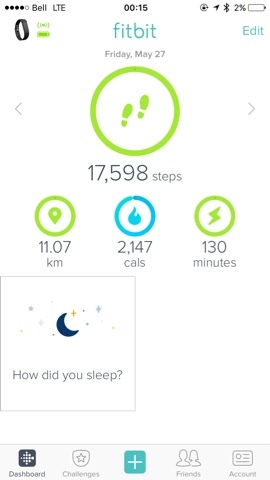 It was a great day and even though no official exercise, I was constantly active and got nearly 20,000 steps so I am not even slightly disappointed. Saturday was a rest day and I did nothing for most of the day. It was a nice change of pace. 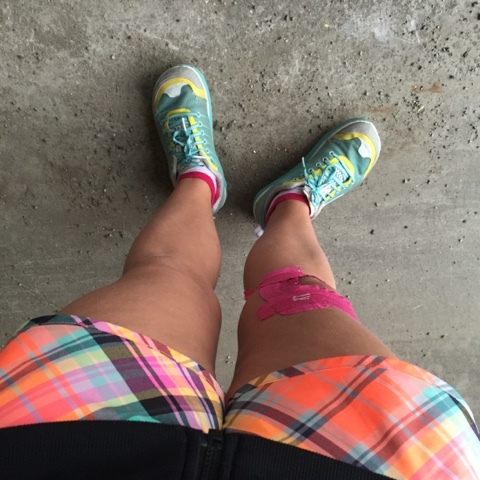 On Sunday I had planned on running from my house to the train station to get my run in but I couldn't find my ITB band and I absolutely cannot run without it. Whenever I try it destroys my knee and takes forever to go back to "normal". So Greg drove me to the train and then he and the girls picked me up at the Stampede Grounds and we headed to Stanley Park to start our bike ride. 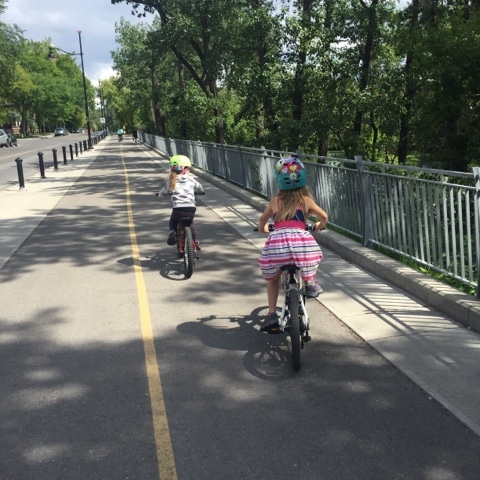 We went through Stanley Park, Mission, along the elbow river back to the Stampede grounds and back. We ended up doing 10.71km which is a record for Penelope on her own. It was her first time on her new big girl mountain bike complete with gears and handle breaks. She was so excited to have bikes just like the rest of us. With her old 16" bike, her record for biking was 5km. She could go forever on her trail a bike because Greg did most of the work. Greg was even more excited about not having a child attached to his bike for the first time in 7 years. It was a beautiful, relatively easy path we took around the city. 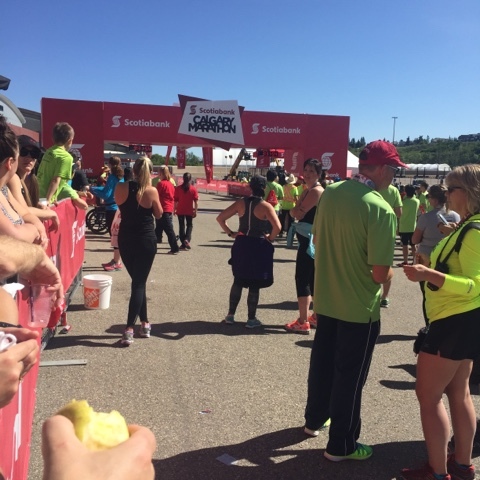 Yesterday I had the amazing honour of volunteering at the finish line for the Calgary Marathon. I had the 11am - 3pm shift which meant I got to hand out medals for marathoners, ultra marathoners and 5km participants. 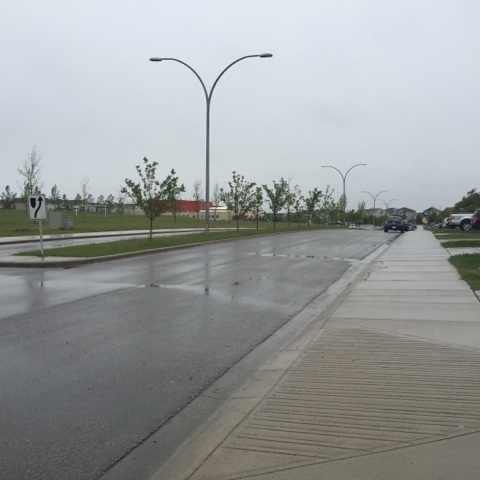 When I first arrived at the Stampede Grounds, I was so jealous of all the half-marathoners who had already finished and were heading home. I ran this race for the first time last year and I loved it. It is hands down one of my most favourite races ever. I had planned on running it again this year but my physiotherapist suggested that I skip it and just focus on the half marathon I am doing in June. My right hip is fairly weak and I am trying and working really hard to get it back strong enough to get my next 3 half marathons ran at the best of my abilities. But I put that all behind me and went to Finisher's Line and focused on my job at hand. And what an amazing job that was. When I first got there, we were unwrapping all of the 5km medals and getting them ready to hand out to all of the 5km participants. They were the last race to start and they all finish like mad around the same time so we had to be organized. Once that was done, the early shift on the finishing line headed home and we started handing out medals to the ultra marathoners and marathoners. It was so inspiring to be there when the runners crossed the finish line after such a gruelling race. Congratulating each runner and putting the medal around their necks was just so rewarding for me. They have all worked so hard to get to this moment and you saw that on each and every one of their faces. You saw the pride, the sense of accomplishment, you saw the hours and months of training and suffering that goes into accomplishing this, you saw tears of pain, tears of joy. You saw people throw up as soon as they crossed the finish line, you saw them collapse into fellow runners and into wheel chairs. You saw them hug their biggest cheerleaders and supporters. It was so inspiring and encouraging. The 5km race started at noon and the first finished crossed 19 minutes later and the last one around almost an hour after that. This race had so many different people - some were running for the first time, some were running to raise awareness for charities that were near and dear to their heart, some were running with disabilities to prove that they really could do anything and everything that those without disabilities could do. There were little kids who were running in this race because they had seen their mom and dad do so many times before and they wanted to be just like them. I saw a mom pushing a massive stroller with 2 kids in it and a baby strapped on her chest. She is a true super hero. There was no way that anybody watching from the stands or who had the honour to give these amazing people their hard earned medals wasn't moved by the accomplishments of this race and really any race that was ran yesterday. We are lucky to live in a city with super hero people. I was lucky enough to have several friends running in races and I got to give 3 of them their medals along with one of their littles. Shannon was first as she crossed the finish line at four hours and fifty-five minutes after she started her Ultra Marathon (50km). I was so happy to see her cross the line and give her such a huge hug and put that medal over her neck. She is a great athlete and an even better friend. She inspires me and so many others on all levels and we are grateful to have her in our corner. My fellow friend and boot camper Amy was doing the 5km and I was pretty far back and was worried she wouldn't see me but she ignored all the medals being tossed her way and found me. She was the first 5km medal that I was able to give out. She had a pretty sweet time too!! And my friend Heather and her little Harper crossed the finish line and I was able to spot them with Harper on her shoulders quite easily. It was really awesome to get to give all of them their medals. 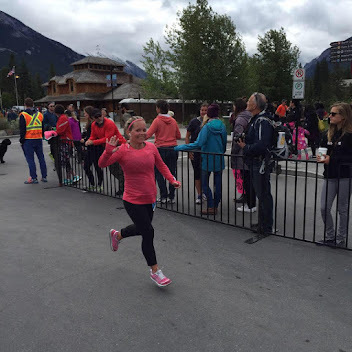 Heather also ran the 10km earlier that morning so she had a great day at the Calgary Marathon. If you ever want to get involved in something encouraging, inspiring and amazing, I really recommend you volunteer at any capacity at Marathon in or near your city. It was truly one of the best things I have ever done and it certainly made not being able to run it not even matter in the least. I won't lie, I was glad I was wearing sunglasses because on several occasions, my eyes started to water. I will blame all of the fluff in the air. I was inspired, encouraged and committed to work even harder at getting stronger, faster and healthier. It made me want to be better. And even if you are not a runner like I am, it will do the same for whatever lights your passion. You will leave the race wanting more. Thank you to the city of Calgary for being so amazing and for all of the volunteers who make this race so successful. It was amazing how many times we were thanked as we handed over medals to the runners. No matter what your role is, you will make a difference. And even if it is just in one runner, it is still worth it. And most importantly, congratulations to all the participants in all of the races. We had 10,000 runners take part and they raised over a million dollars for local and national charities that mean the world to them. Already looking forward to 2017...but will it 21.1 or 42.2 km???? That is the question!